Here at Sun Yi’s Academy in Arcata we believe in a holistic and balanced approach to training, as well as life. We strive to offer our members opportunities to foster a Sound Mind, and Sound Body by providing a diverse array of classes and services, and a high quality of instruction and facilities. By training both the mind and the body–by learning to master our thoughts, emotions, and actions–we become more capable handling any challenge in life, whether it is a physical or violent encounter, or an emotional, financial or other difficulty. Each week in our classes, for example, we briefly discuss one of the Tenets of Tae Kwon Do, or a related insight from Martial Arts or other useful philosophical traditions, and how it applies to our success both on and off the practice mat. In addition to training you to reach your peak potential in class each night, we also support your practice outside of the classroom. Sign up for our weekly facebook posts and tweets–or just check our website weekly–for lessons on philosophy, health advice, and technique tips. Every Monday we will give you an update on our schedule or any upcoming special events to keep you connected to your school. On Wednesdays we will send you a technique tip to improve your practice or a health tip to improve your physical health. And every Friday we will send you a philosophical lesson or psychological strategy to improve your mental health and success in life. Sun Yi’s Academy Arcata offers a well-rounded and diverse array of classes, so there is something to offer everyone, both families and individuals of all ages. Whether you are primarily interested in Tae Kwon Do training for developing your own, or your children’s, self-discipline and self-confidence, or whether you are more interested in improving your self-defense skills and physical fitness, our classes will help you achieve those goals. Our carefully designed system of instruction makes starting your training easy and enjoyable for beginners with no previous experience, while our high caliber of instructors can push even the most experienced martial artists to excel further. Mixed Martial Arts classes on Fridays, also offer students an additional way to train for self-defense and gain more experience with a wide variety of different fighting styles. You may also choose to compliment your Tae Kwon Do training, by taking advantage of our weight and fitness equipment and callisthenic training area. Free orientations and advice on designing a weight or fitness training regimen are provided for our members for free by Master Lewis. You will also find the spacious locker rooms and showers, and sitting area enjoyable, as we encourage Sun Yi’s Academy members to make Sun Yi’s their home. In addition to our Martial Arts classes, we offer a variety of healing modalities to help free you from pain, rehabilitate injuries, and bring you to your optimal state of mental and physical health. We offer a variety of services ranging from Deep Tissue, Swedish Massage and Body Work to help you heal physically, as well as Reiki therapy to help you heal both physically and emotionally, and personal life and self-mastery coaching to help you achieve your greatest success in life. 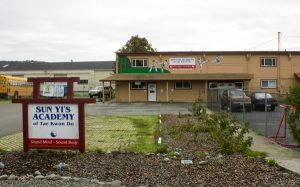 Sun Yi’s Academy in Arcata is part of nationally renowned Sun Yi’s Academy of Traditional Tae Kwon Do, more than 35 years strong and growing, with locations across the United States. 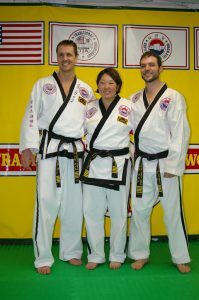 With thousands of currently practicing black belts in locations ranging from North Carolina, Kansas and Minnesota, to Colorado and California, each Sun Yi’s Academy, like each Sun Yi’s member, is part of an extended family-like support system. 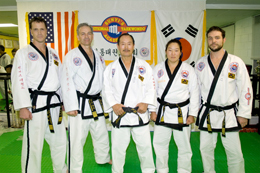 Each year instructors and students from across the nation return to Sun Yi’s Academy headquarters in Topeka Kansas for special training seminars, as well as for the Traditional Tae Kwon Do Championships held each spring. In addition, black belts and instructors regularly visit Sun Yi’s Academy in Arcata to judge promotional testings and host specialty training seminars. As a member of Sun Yi’s Academy in Arcata, you will enjoy the benefits of joining this large and growing family of schools. Here at Sun Yi’s Academy in Arcata we believe in developing the self while also forging strong relationships with others, improving our health both as individuals and as a community. We invite you to join our extended family and to begin enjoying the benefits of a Sound Mind, Body, and Community today.